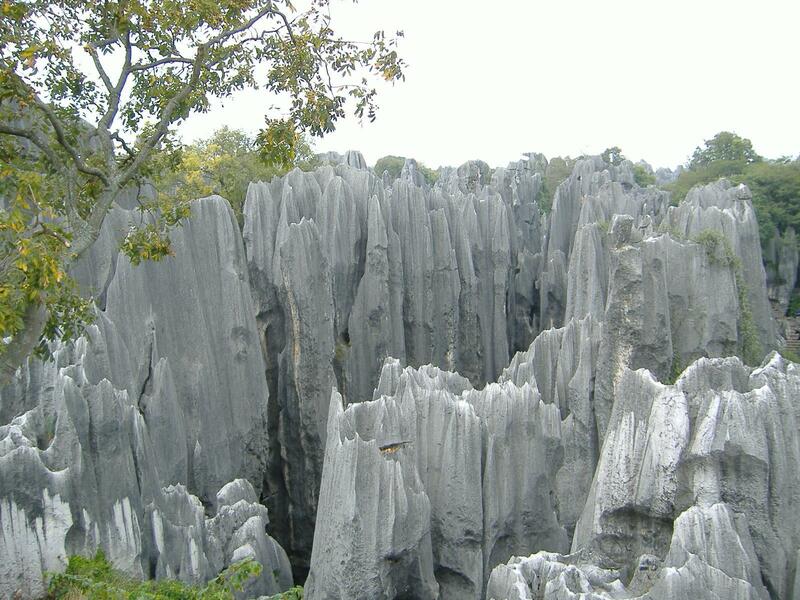 The Stone Forest is to the southeast of Kunming, belonging to Shilin County(originally Lunan County). It is 350 square kilometers in area, and 90 kilometers away from Kunming. It is well-known both at home and abroad. The scenic spot consists of seven parts, namely Dashilin, Xiaoshilin, Naigushilin, Dadieshui, Changhu, Yuehu, Zhiyundong and Qifengdong. Being one of the National Scenic Resorts in China, Stone Forest Scenic Resort is 83km from Kunming and has a complete range of karst formations. Among the most wonderful attractions in this area are the following eight scenic spots: Large & Small Stone Forests, Naigu Stone Forests, Large & Small Zhiyun Caves, Qingfeng Cave, Long Lake, Moon Lake, Fairy Lake, Feilong Falls. Standing upright in the Stone Forest are innumerable cliffs and peaks, lofty and majestic, steep and precipitous, charming and enchanting. An interesting legend related the attraction goes that a heroine Asham of the Sani( the Sani people are a branch of the Yi nationality living in Yunnan province) was bore into a poor family in today's Yunan region. The girl was very clever and she began helping her father herd sheep at the age of 12. One day in the mountains she saved a boy named Ahei who had lost his way while picking wild fruit. Ahei, a 12-year-old orphan, had to toil for the landlord. Sympathizing with the poor boy, Ashma took him home. Ashma's parents took pity on Ahei and fostered him. Ahei and Ashma grew up together and they fell in love with each other. They got married and lived a happy life. But Ashma was later abducted by the man, Azhi, the landlord's son who was eager for the lady's beauty. When Ahei-the husband learnt the event, he killed the landlord and his son and rescued his wife-Ashma. The lovers went into the stone forest and lived happily there ever after, giving birth to fine sons and daughters who are said to be the ancestors of the Sani people.